German Ambassador to Vietnam, Ms Jutta Frasch on April 12 inaugurated a new highlight for visitors of the Imperial City of Hue as part of Hue Festival 2014. With financial support from the German Federal Foreign Office (around EUR140,000), a team of the “German Conservation Restoration & Education Projects (GCREP) from the German NGO ‘’Gesellschaft zur Erhaltung des kulturellen Erbes e.V” was able to restore the historic wall paintings in the Mandarin house Ta Vu in the ancient Imperial City of Hue from November 2012 until July 2013. The team also conceived a new permanent exhibition in cooperation with the Hue Museum of Royal Antiquities (HMRA) that offers a fresh and vivid insight into life during the Nguyen dynasty. Under the theme “Impressions and treasures of the Imperial City“, the exhibit is open daily from 7 am to 5 pm. No additional entry will be charged if you have a ticket for the Imperial City. Nine young Vietnamese artists and craftsmen received a specialist on-the-job training within the project’s framework. The new Ta Vu permanent exhibition is the first comprehensive documentation right in the middle of the World Heritage Site to make different aspects and main actors of life under the Nguyen dynasty accessible to a larger public. Images and photographic reproductions of the Imperial Era are displayed on 17 large-size boards. Furthermore, information on the Emperors and their families, architecture and palace staff, daily routines as well as court ceremonies, music, clothing and cooking is described. 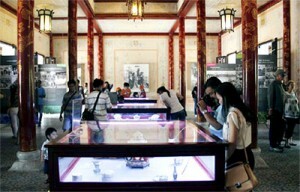 The Imperial cuisine is highlighted through bronze and porcelain exhibits. With this exhibit, the newly restored Ta Vu house in the heart of the citadel of Hue becomes a highlight for new and old visitors of the Imperial city and UNESCO World Heritage Site.